Financial districts sometimes get neglected as tourist locations, and that’s a shame. Did you know that downtown San Francisco has over 68 POPOs? That stands for Privately-Owned Public Spaces. Some are outside of the skyscrapers, others are on rooftop decks, and they’re all cool public spaces, often with statues and sculptures. You’ll explore many of them in your downtown teambuilding scavenger hunt. Remember, the financial district was built on land fill created by abandoned ships from the gold rush era! If your office or meeting hotel is downtown, this is the corporate teambuilding hunt for you! Built on the husks of old Gold Rush ships, the Financial District – the money capital of the west coast — has been a bustling place for over 200 years. Its shoreline originally started at Battery Street but was filled in and extended to the Embarcadero. 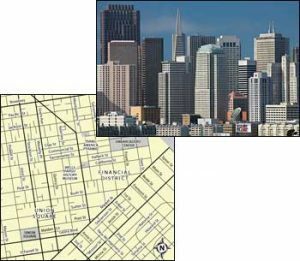 Destroyed completely by the earthquake of 1906, the district was rebuilt to its current glory – a mini-Manhattan with a manageable, San Francisco feel. During your Financial District hunt… expect to encounter: a column of dolphins; a statue of Gandhi; a celebration of celebrated columnist Herb Caen, and much, much more. Not every corporate teambuilding program is the same. Depending on your group, your focus may be integrating new people into the team and breaking down personal boundaries and divisions. Or you may have an existing department where teams could, with a little practice, cooperate and communicate more smoothly across teams and divisions. Or you might simply have a group that thrives on the use of technology. Let Dr. Clue customize your hunt program by selecting the content focus that best matches your group and your needs. Gather at Justin Herman Plaza. See all of our San Francisco corporate team building events, indoor and out.